Very happy that one dose is available for purchase! Order was fulfilled quickly. Great! Good price and they contact my vet for the RX. Easy procedure. Thanks! I like this product and find that it is effective and without side effects for my cat. This was my first order from Entirely Pets, but not my first purchase of Revolution. The price was great, but it took about 10 days or longer to receive my order. I ordered a week or more in advance of when I would need the next dose, but it did not arrive in time. I had to borrow a dose from a family member who uses the exact same product. The 3 doses did not come packaged in a sealed box from the manufacturer, as they have with every other online stores. There was no packaging at all, just 3 does in an envelope. Merchant Response:We have since perfected our prescription approval process. Our turn around time is under 3 days. Glad to have you and your cat as customers! Revolution brand flea and tick treatment is the only brand that has worked, and I have been treating cats with it for over 20 years now. It is well worth the cost of testing the cat for heart worms prior to using this product. 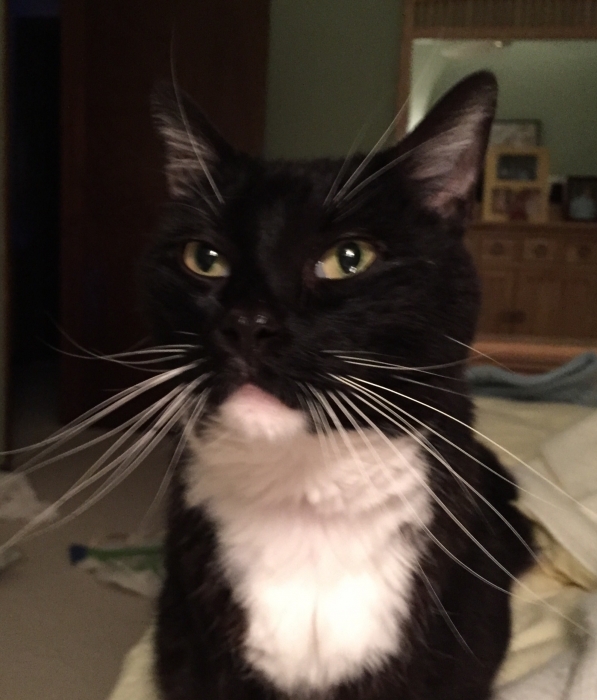 ConsI had a little problem with ticks on one of our cats that likes to roam and hunt this winter. I did pull them off after locating them around her neck area, but this left sores that took weeks to actually heal and cover over with fur again. Our home sets on 3 actress and is next to a wooded lot, with a lot of sand pine trees. I know pine trees are notorious for breading ticks, soo I am hopefull that in the future the Revolution will work better. My Vet originally told me about revolution so My cat gets his monthly dose with no problems. We have a large short-hair all white cat named Princess with the thickest fur I have ever, ever seen on a cat. She is not allowed outside. The other flea medication we used stopped working and she got fleas. She was miserable, as were we. Revolution for Cats works great on Princess as she weighs 19 lbs. This is no thanks to Entirely Pets Pharmacy. Do not trust Entirely Pets Pharmacy to ship right away. They do not! By the time they finally shipped the prescription, we had left Illinois for California. So, I had to go to the expense of shipping it back to Illinois the the lady who was caring for Princess in our absence. I had to ship it Fedex Overnight as she was 3 days past due on this medication for fleas, ticks, ear mites, etc. This is the SECOND time this has happened, so Entirely Pets Pharmacy cannot say it just "fell through the cracks" as I'm sure they will claim. Dreadful service, and I have emails to them to prove it. No one at Entirely Pets Pharmacy, apparently, reads emails although the encourage customers to communicate with them! ProsRevolution for large cats work just great. ConsEntirely Pets Pharmacy cannot be trusted to ship right away -- even if they have the prescription already! As a customer, I don't know if it is the fault of the person filling the prescription, or the shipping department. And no one actually reads emails they receive. 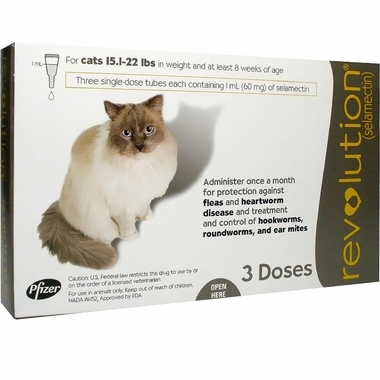 My cats have been pest and parasite free using Revolution for several years! We travel all over the country and they would be continuously exposed to many different kinds. This is supposed to be the best prevention out there right now. I've been using it a little over a year for my cat, and he has not had a problem. Irradicate fleas from your Life! This Product is the best on the market, since using it our home, animals and front and back Yard are Flea free! Even in this hot weather and even skipped months of treatment in winter. Because no fleas. But it also keeps the heart worms and ticks away too! Also it disappates quickly after applying and the animals recover from the fear of being treated easily. Highly recommend this and worth every penny, but I wish it were less expensive. Thanks for the prompt service and delivery. ProsFast order and delivery excellent product. ConsNo complaints other than the price of Revolution being high, but product is great and your price too! Ordering from Entirely Pets is seamless! They contacted my veterinarian for the required prescription, delivered the product to my door, AND I saved money. My kitty cats say "meow" (thank you) and so do I.
EntirelyPets does a superb job delivering a fantastic product! Thank you for your quick delivery! All cats need heart worn protection just like dogs! Easy to use.